There is an ongoing debate on the building of the new State House. As such, both serving and ex government officers have had a chance to make their case, either for or against the construction of the said structure. Having followed the debate so far, I certainly find myself better placed to pass judgment or opinion on this important issue, especially that not so long ago, I participated in it. Nonetheless, a quick glance at the justifications being advanced by those propagating for the construction of a new State House portrays a state of a squalor and unimaginable corrosion of the structure. I must confess that this conclusion has shocked me, and my immediate thoughts are that this is not the case unless the state of the property has worsened so rapidly in the more than two years I have been out. That said, let me state from the onset that I am fully aware of my limitations, knowing that I am neither an engineer nor have I seen the most recent structural report of the said property. All the same, I strongly feel to portray the situation as a serious headache, an almost apocalypse, or as though our Head of State is on the verge of operating or sleeping in a tent like a Bedouin (Nomadic Arab of the desert), is not being fair and sincere with the many citizens who deserve nothing but the truth. So, here is my take on this issue, firstly, indeed, I agree that the structure is old and something needs to be done about it. Secondly, the structure is not beyond repair and restoration. Hence it can be renovated in a very cost effective manner while retaining its historical value and significance. This can be done, and President Michael Sata demonstrated in the early weeks of his presidency, when the entire space where photo sessions at State House are held was given a facelift in the most efficient and cost effective way. Those who have been regular visitors at State House throughout the different tenures of office, of all our six (6) Presidents, I believe can attest to this fact. Thirdly, as a third world country we have to operate within our means. We have to appreciate our modest economy and its challenges, and work within what we can afford as a country, and not rely on external grants to maintain certain standards. In fact, it’s wrong to compare ourselves to more affluent countries and how their Presidents live and work. Neither will it be helpful to compare ourselves to some equally poor but extravagant African countries. Let our State House be a reflection of the state of the country. As Margaret Thatcher, in Penny Junor’s book entitled ‘Margaret Thatcher: Wife, Mother and Politician’ argues: “To tell a family that was overspending its income to go on spending and borrowing was ‘the morality of a man who has his hand in someone else’s pocket’” (Junor 1983, p.148). Surely, every entrepreneur worth his name knows that the acquisition of assets and investments must be commensurate with the books of accounts. Maybe at this point I must answer the question. Is the situation at State House an emergency? Based on my knowledge of three years ago it is NOT, one can sit and work, and attend to the needs of this country without any problem. It is in its correct state as a place of service in a poor country like ours, and in that building President Sata was preoccupied with serving the people and I believe other Presidents before him, did the same. And just as a side note on President Sata, an impression is being given that the man didn’t understand the ‘gravity’ of the situation with regards to the condition of State House yet to the contrary he did, and he was well briefed that the place will not crumble on him. Surely, if the situation were as apocalyptic as it is being portrayed, President Sata would have been the last person to risk his own life. The reason President Sata curtailed plans to construct the new State House was because he was convinced that it wasn’t a priority whether financed by a grant or a loan; he felt such monies (grants or loans) were needed more in areas such as health, education and social security. President Sata’s dream was to see a university in every province of this country; to see a top level hospital or referral health centre in every province; and to improve science and technology because he anguished at the thought that this country could not even add just a little bit of value to its raw materials. For all I knew about President Sata, this was a man with incredible desire to do so much for the people yet he had a shortage of years on his life [May His Soul Rest Peace]. Therefore, to selectively portray him as though he was reckless in rejecting the project of a new State House is to do an injustice to a man I knew carefully considered and thought through every decision he made. I can only accuse him of one thing, and that is, he was always too people-centred in his decision-making. If it wasn’t for the people, it wasn’t worth doing. FULL STOP. Also, we have to demonstrate the creativity required of a people that has scarce resources. Countries with the same level of insufficiency that have chosen a more progressive development path have demonstrated that a President can live in one area and work in another or we can have satellite offices linked by information systems where a President can have access to all his aides and officers without needing them to be in the same building as he is. IT systems have made things that easy. And in that regard, I am given to think about the State Lodge presidential Guest House in Lusaka, and the Ndeke presidential Guest House in Kitwe, which President Sata literally revamped from the ground. By the way, the Rupiah Banda administration clearly neglected these important structures; the vandalism and lack of maintenance and repair was so evident, and today I stand tall to see President Edgar Lungu utilizing the refurbished structures in these two places, a situation his late elder brother never inherited. Even the said leakages which had necessitated the use of buckets to collect leaking water, was clearly a case of lack of effective maintenance and repair by the administration at that time, because this became a thing of the past as soon as Michael Sata walked into that office. To reinforce this, if one is sincere, they will admit that the changes Michael Sata brought to that place could be seen from how he transformed the surroundings in and around State House… so busy was the previous administration that even the golf course and lawns suffered neglect. To cut the long story short, President Sata’s argument was “Why build another State House if you are failing to maintain and repair the current one with its sister structures in State Lodge (Lusaka) and Ndeke (Kitwe)”. 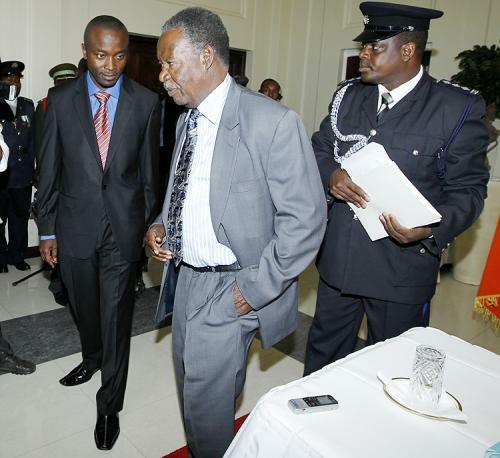 Was Sata thorough in arriving at this decision? I leave it to the Zambians to judge.